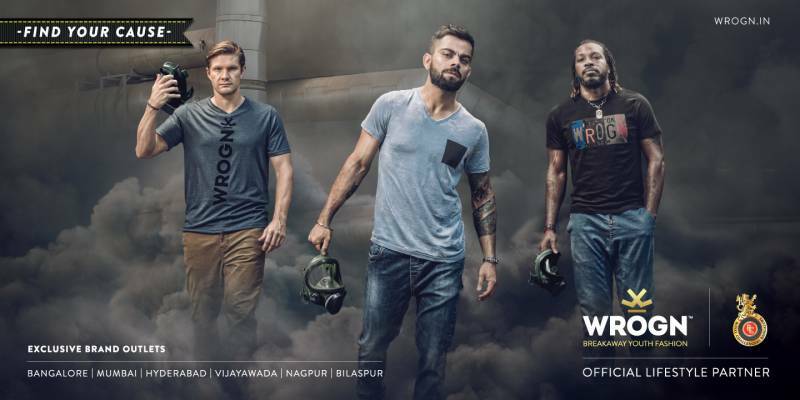 India's most promising celebrity fashion and lifestyle brand WROGN is associated with Royal Challengers Bangalore (RCB) as the official lifestyle clothing partner for the 10thedition of the Indian Premier League. Off field the RCB players will be seen in WROGN merchandise and while on field their caps and helmets will sport the WROGN logo. WROGN merchandise is designed to complement the team’s playbold philosophy and makes a fearless, daring & heroic fashion statement. WROGN’s in-stadia branding will also add colour to the home ground and will augment the vibrant and lively atmosphere during the matches. This annual association will be promoted by both partners through their digital properties; their official site and social media channels. Additionally, the brand has comprehensive plans to engage and interact with RCB fans and WROGN customersat WROGN outlets across the country. All customers of WROGN clothing will also be entitled to tickets to the RCB matches. Fans are of assured free tickets to watch live RCB matches in Bangalore by purchasing clothing /merchandise worth Rs.5000/- and above from the WROGN line.